What Is Bridesmaid Dress Shopping Like? Wedding dress shopping was so hard for me ... but bridesmaid dress shopping? Oh, that was a breeze! I didn't have to do anything but watch my bridesmaids put on a fashion show for me. But, really though, what is bridesmaid dress shopping like? If you go to a chain dress shop, you can check the styles online before you go. Most will allow you to search by color, which is a good way to sort. Since your bridesmaids dresses really need to match your wedding colors, you want to eliminate any dresses that aren't in your colors (and avoid potentially falling in love with that dress and then needing to change your entire color scheme). 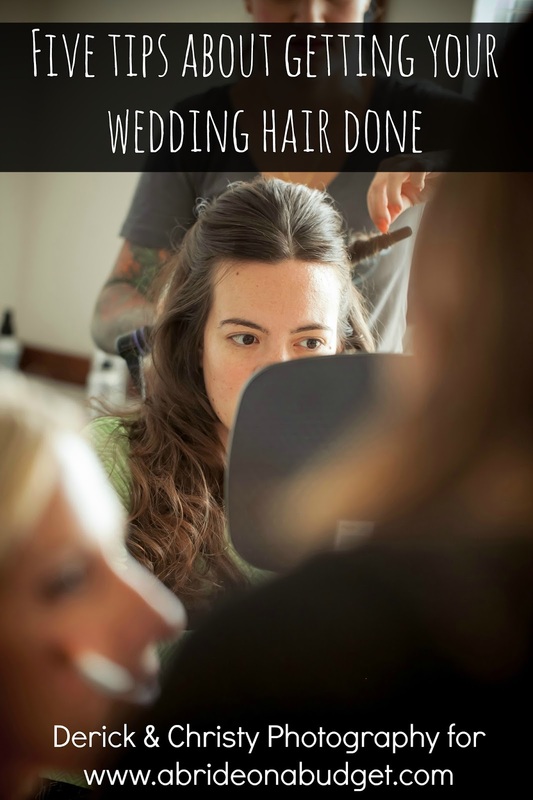 I actually did this with my maid of honor the night before we went bridesmaid dress. I texted a bunch of photos with huge bows and puffy shoulders to my bridesmaids, joking that I would be picking those. But, really, I found a dress I loved (although it only came in wisteria, not eggplant like I had originally wanted for my bridesmaids), but went to the store with an open mind. Three of my bridesmaids met me at the store the next day. Before they started trying on dresses, the consultant asked for their shoe sizes. She wanted them to try on dresses while wearing heels (which is what you do when you're wedding dress shopping too). She brought over a few pairs, then asked for their dress sizes so she could grab the closest samples. I sat in a chair. That's basically all I did for most of the time we were there. I told the consultant about a long gown I saw online that was just incredible. It had ruffles down the front and was perfect for our summer wedding at the beach. She grabbed three so everyone could try it on simultaneously. It looked amazing on two of my girls ... but looked like a mess on my maid of honor, so it was crossed off the short list. The consultant pulled a few other samples for the girls to try on, but I was underwhelmed. So I left my chair and rummaged through the racks. I found a few I liked, so the consultant left to pull them for all three girls. There was a dress that all three of them looked great in ... but it looked like they were going to a club rather than to a wedding. Maybe a guest or two might show up in something like that, but it wasn't bridesmaid-appropriate. And, finally, after trying so hard to not just go with the one I found originally, I gave in. I asked the girls to try that one. Of course, as luck would have it, I just loved it on all three of the girls. They were all different shapes and sizes, but they all looked beautiful. I just knew that would translate well to the other bridesmaids who weren't able to make it to shop with us. I was upset that it didn't come in eggplant, but our colors were eggplant, lilac, and silver. Since lilac and wisteria are just different ways to say similar colors, I had to decide what was more important: having a dress I loved or having a dress in a darker purple hue. I told myself that since it was summer, the lighter dress would look better, and I abandoned my dream of bridesmaids in eggplant. This is why I'm warning you to filter by color before you even look at dresses. You don't want to fall into my situation. 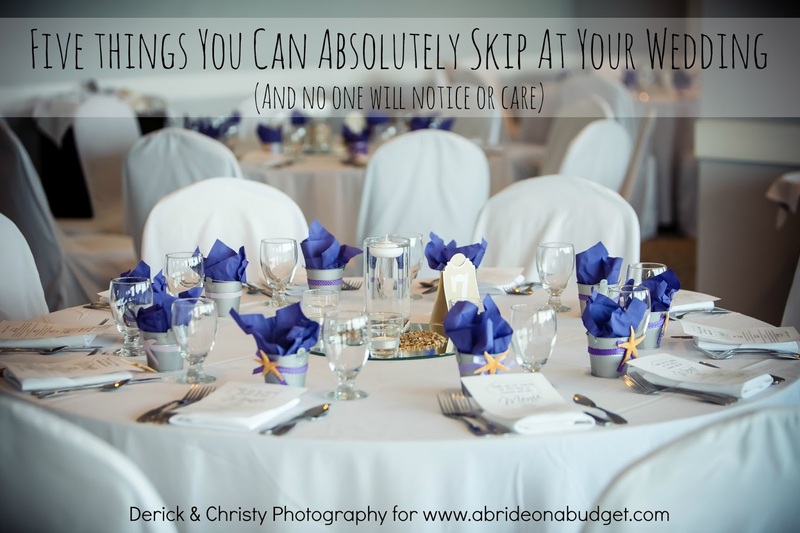 I said yes to that dress and, as the consultant went to grab paperwork, one of my bridesmaids encouraged me to ring the "Say Yes To The Dress" bell that's usually reserved for brides ... which I did, ever so quietly, after the consultant turned the corner. She came back and took down the names of my bridesmaids who were there and asked what sizes they wanted to order. And that's the hard part. You may not exactly try on a dress in your size or you may be in-between sizes and you'll have to get the dress altered. Plus, between shopping and ship time, you might lose a couple pounds and that could change your dress size. So you need to order the closest size, without going under (basically, the opposite of The Price Is Right). If you order a size too small, there won't be any extra material to make the dress bigger. If you order a size too large, though, you can always take it in or up. The bridesmaids who were there ordered their dresses immediately (and then we went out for pizza). The others had to call the shop, give my name, and then they could order. When the dresses came in (and the arrival times were staggered, based on size availability), the shop called the girls to pick them up. Whoever needed alterations got those done, and they all showed up in perfect dresses on my wedding day. It was the first time I had seen all my bridesmaids in the dress and I couldn't have been happier. No one complained (not to me anyway), so I think they were all happy too. 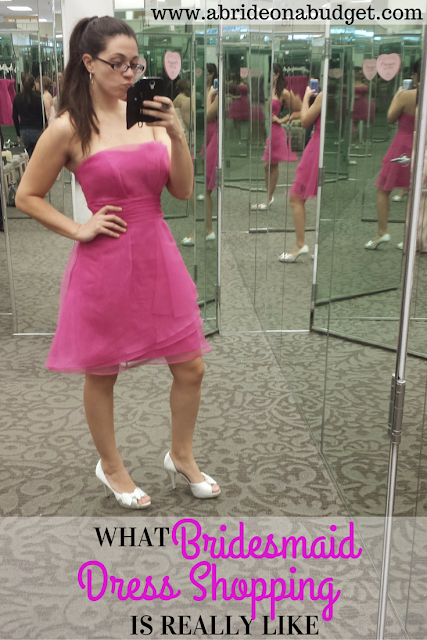 BRIDAL BABBLE: What was your bridesmaid dress shopping experience like?